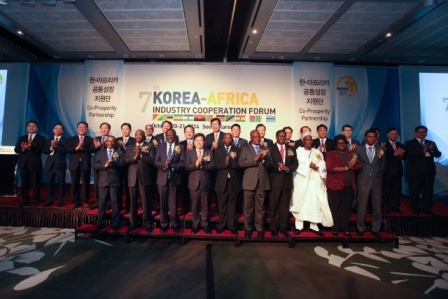 Sierra Leone, through her Ambassador in South Korea, was one of the 29 African Countries that recently participated in the 7th Korea-Africa Business Forum that was recently staged in the Korean Capital of Seoul on the 20th October. The session, opened by the Korean Minister of Trade Industry and Energy, Hon Yoon Sang-jick, brought together Trade Ministers from Madagascar, Angola, Mozambique and Congo-Brazaville and was also attended by Senior Diplomats representing their respective Countries in Seoul. Sierra Leone was represented by her Ambassador stationed in the South Korean Capital, His Excellency Ambassador Omrie Golley. During the meeting, His Excellency Ambassador Golley took the opportunity of briefing Senior Trade Officials from the Ministry of Trade Industry and Energy who hosted the Conference as well as Korea’s leading banks and financial instiitutions, as well as other major Korean public and private Companies, on the opportunities Sierra Leone had to offer in agriculture, mining, tourism and off shore oil exploration. Ambassador Golley also dilated on plans by Government to re-energise the economy once the Ebola epidemic had been eliminated from the country. 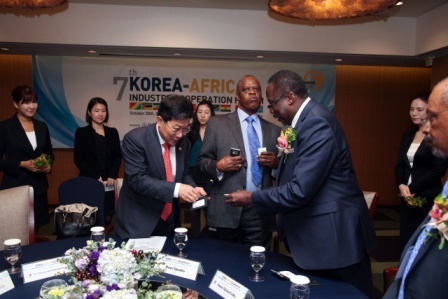 The recently concluded Korea-Africa Forum is the 7th high level business conference drawing together Korean business and finance bodies and representatives of developing countries in Africa in a spirit of mutual collaboration. The Forum had its first conference in 2007. The theme for this year’s Forum was ‘Co-Prosperity & Partnership’. Speaking via phone,Ambassador Golley spoke of his strong will to support his country’s drive to prosperity by engaging trustworthy Korean investors as well as positively telling the world about the potentials Sierra Leone has in a number of areas. Speaking on relevance of the Forum especially for a developing nation like Sierra Leone,Ambassador Golley said, Korea has developed in a remarkably short period of time, just 50 years, from an impoverished nation dependent on a small agrarian economy, and shoe manufacturing, serving their hitherto colonial masters Japan, into the 11th largest economy in the world. “Their economic prowess in the fields of communications technology, car manufacturing and related services are a testament to their philosophy of hard work and enterprise. This is worthy of emulation for us in Sierra Leone. With the will and sheer determination, we can do it as well”,he said.